We have emerged as the most reckoned names in the industry, engaged in trading and supplying an extensive range of Baby Weighing Scales. Our entire range is specifically procured from vendors who make use of quality approved components and advanced techniques during the fabrication of the products. Moreover, the excellent infrastructural facility of our vendors assists us in maintaining timeliness in even bulk orders of the clients. To our customer’s delight, we offer the range in several designs and specifications at most competitive prices. 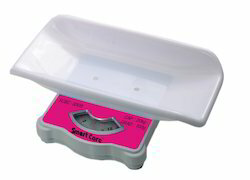 Looking for Baby Weighing Scales ?